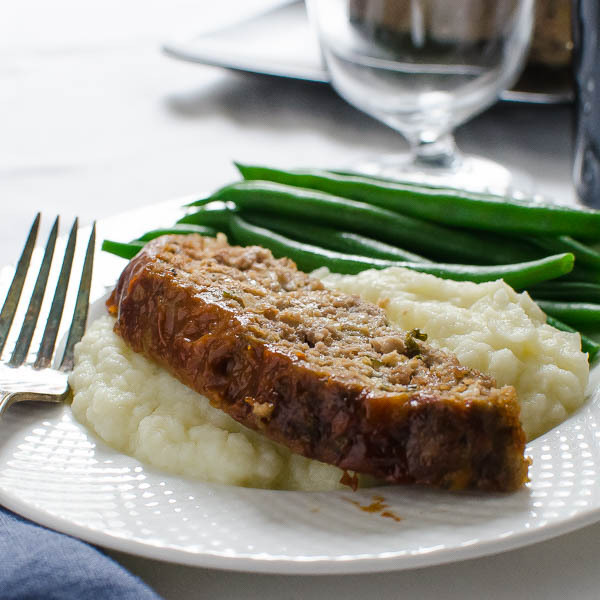 In the list of Top 10 Comfort Foods EVER, meatloaf ranks as a solid #6. 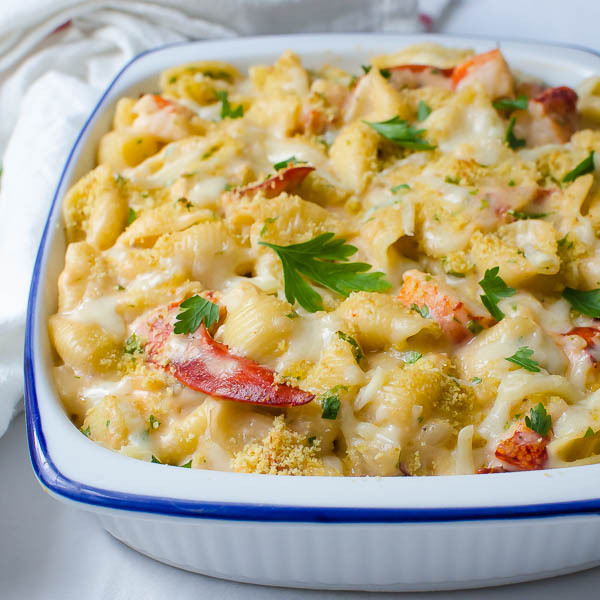 No one would argue that mac and cheese is #1. A good roast chicken is definitely #2. Duking it out for #3 and #4 – spaghetti and meatballs and pot roast. 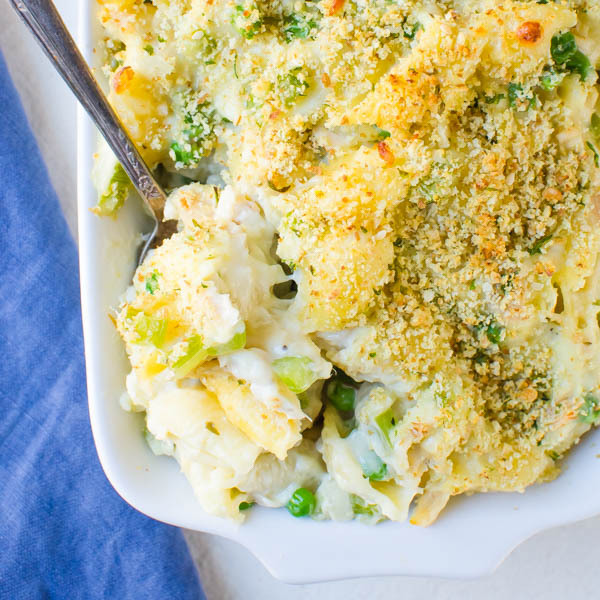 #5 arguably goes to buttery mashed potatoes — and when combined with that roast chicken or pot roast, it’ll give the mac and cheese a run for its money. For me, meatloaf is #6. 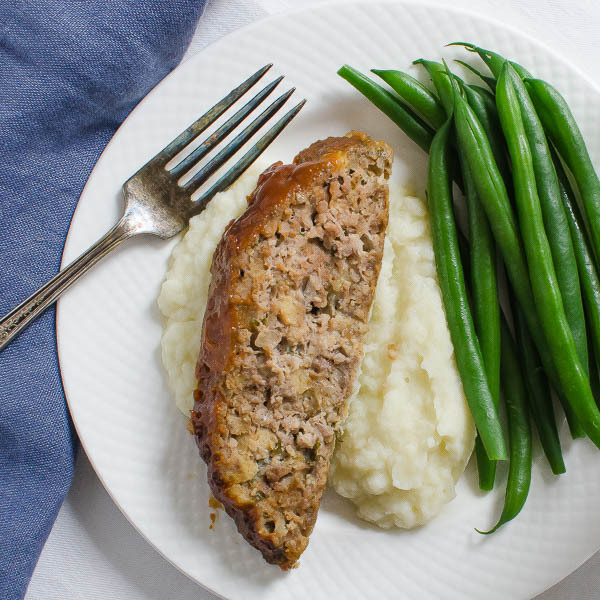 Meatloaf is that menu item that catches your eye because it speaks to your inner kid. It’s the thing that Mom or Grandma served that made us smile. It filled us up. 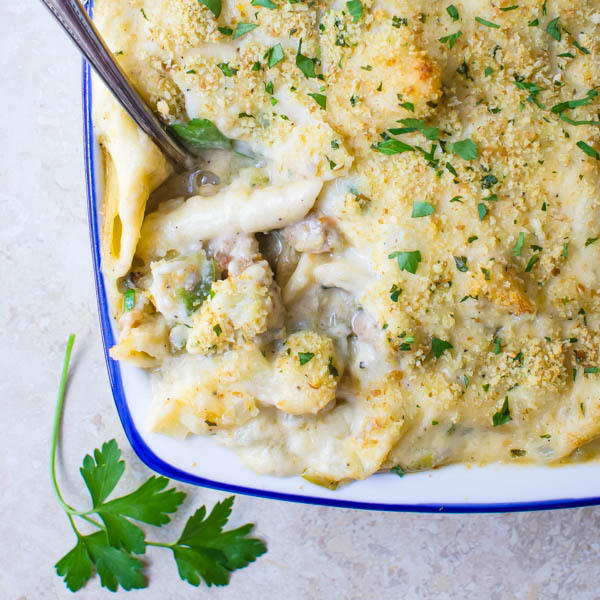 It’s meaty and hearty (and usually comes with the best side dishes – hello mac and cheese or mashed potatoes.) It satiates. It reminds us of home. No matter how high our achievements, a good meatloaf will center us. I know a few politicians who could use a serving. There are so many “methods” to making meatloaf, that I can’t/won’t argue which is best. There is no “best,” just versions of delicious! Personally, I have 3 meatloaf recipes that make the rotations in our house and they are all good but in different ways. This one is a mixture of ground chuck and ground pork, with milk soaked bread, sautéed onions and a sweet, smoky glaze — and it rocks!!! I used to cook meatloaf in a loaf pan (duh), but it always had that weird gray scum that oozed from the loaf and made it look, well, not as appetizing as it smelled. Now, I make a free form shape on the baking sheet. When the ooze comes – and it will, scoop it off with a spoon. Can’t get enough meatloaf? 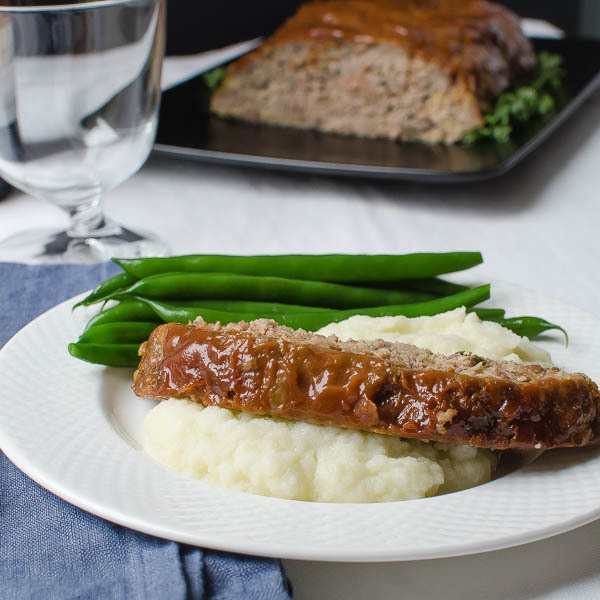 Also try this Meatloaf with Mushroom Gravy for a sophisticated classic! 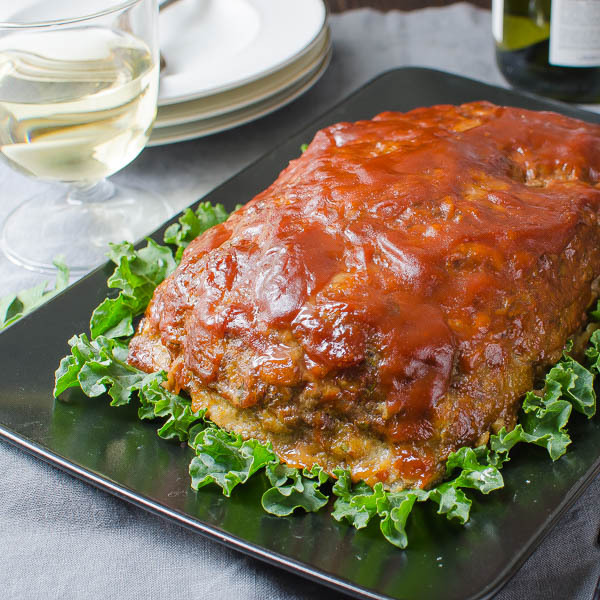 This Savory Homestyle Meatloaf has a blend of ground pork & ground chuck with a bit of Montreal Steak Seasoning and a bourbon brown sugar glaze - Delicious! Preheat the oven to 350°. Line a baking sheet with tin foil and lightly spray with vegetable spray. Set aside. 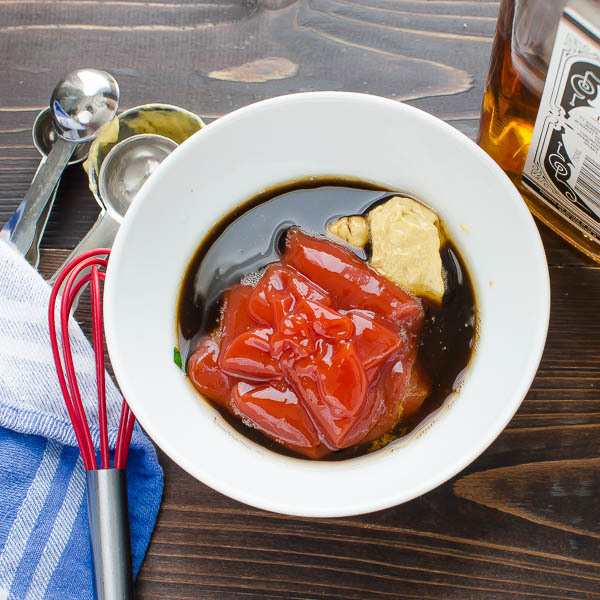 In a small bowl combine the brown sugar, worcestershire, dijon mustard, ketchup and bourbon and stir to combine. Set aside. In a small bowl, combine the bread and milk -- soak for 5 minutes. Meanwhile, in a small skillet, heat the olive oil over medium heat. 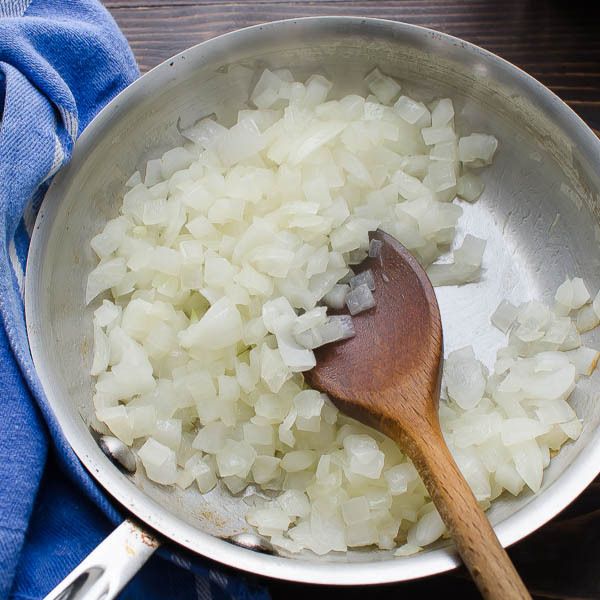 Add the onions and saute until softened and slightly translucent, about 4-5 minutes, set aside to cool while you assemble the rest of the ingredients. 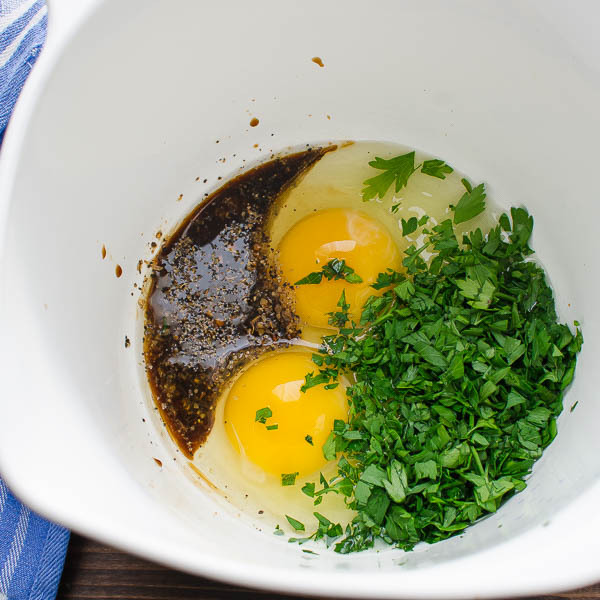 In a large bowl combine the eggs, parsley, steak seasoning, worcestershire sauce and whisk together to combine. 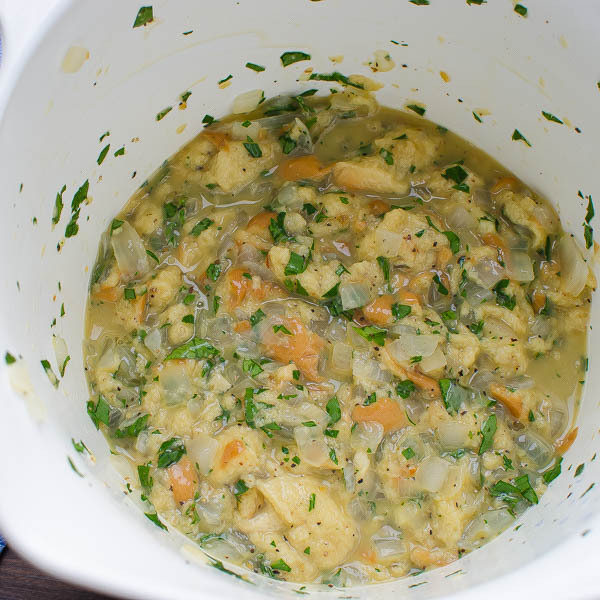 Add the bread and the onions and stir until well incorporated. 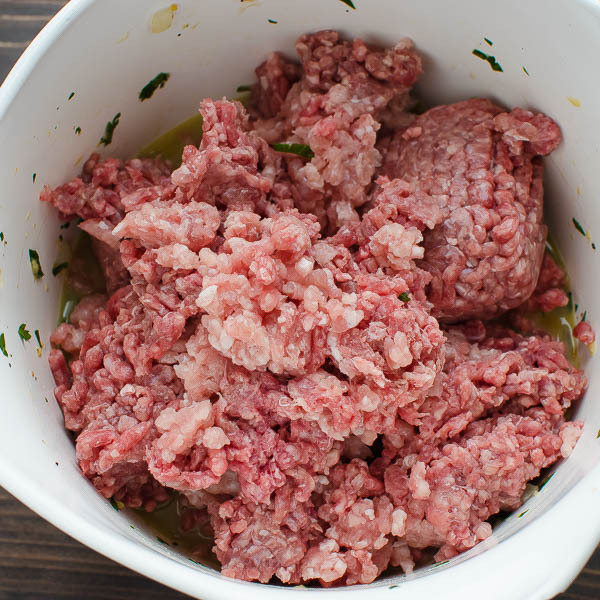 Add the ground pork and ground chuck and fold the wet ingredients into the meat with your hands. Don't overwork the meat -- just continue to gently fold until the wet ingredients are completely incorporated. 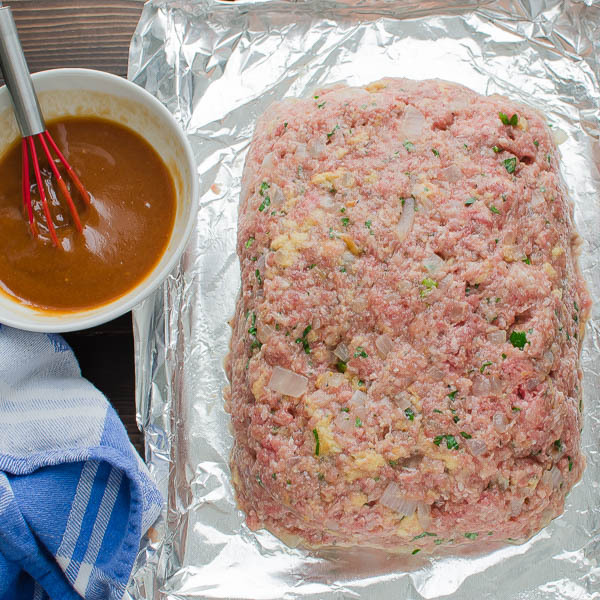 Transfer the meat to the baking sheet and mold it into a loaf shape. Spread half of the sauce over the meatloaf and bake for 45 minutes. Remove the meatloaf and spread the rest of the glaze over the meatloaf. Return to the oven and continue baking for 20-25 minutes. Let the meatloaf rest for 5-10 minutes before slicing. Never liked meatloaf as a child, but wanted to try to make my own to see if that changed. Well it’s either this recipe or I changed drastically, but this was fantastic, simple and easy to put together. This will be my go to for meatloaf drone here on our. Thanks for sharing! I’m glad we’ve converted you, Ron! Welcome to the dark side. 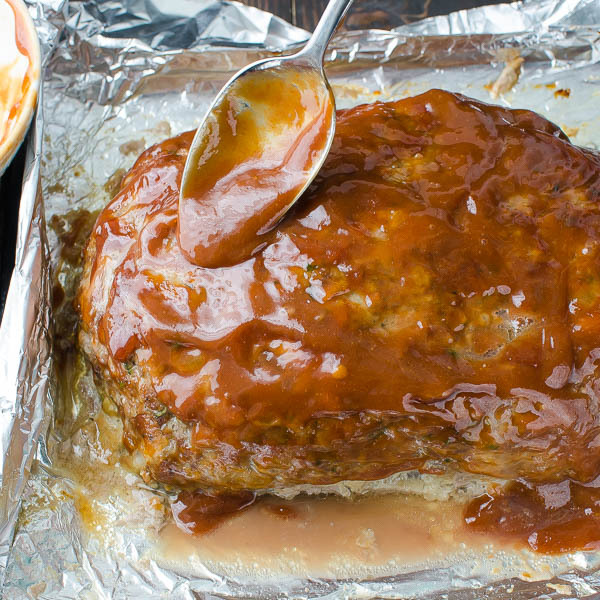 This meatloaf looks amazing with the glaze , I will give it a try for sure. I loved your recipe 🙂 , what can I use instead of bourbon ? Instead of bourbon? If you don’t want to use alcohol, just skip it and proceed with the glaze as directed. Let me know how you like it. Made this tonight for the wife who loves meatloaf! I altered the glaze a bit as we didn’t have any brown sugar or bourbon. I used maple syrup and laphroaig single malt whisky. It turned out amazing! Oh, Wow! I’m so glad you enjoyed it! Your substitutions sound incredible. Can I steal that idea? This looks like a really hearty meal with the mashed potatoes & beans! TBH – it’s mashed cauliflower. My husband actually prefers it to potatoes and it’s healthier! Another great dinner idea for the family! Thank you! This sounds perfect! I love meatloaf and I’m slowly (after 23 years of marriage) proving to my husband that meatloaf does not have to be abomination his mom served when he was young! Maybe this recipe will help bring him around 100%!!! Thanks for the great recipe! No, meatloaf does not have to be an abomination! That’s too funny! Comfort food at its best Lisa! Love it! 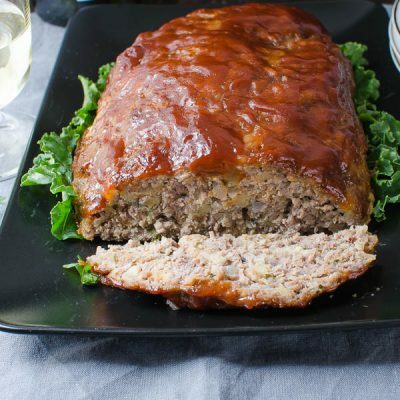 I love meatloaf and this recipe looks incredible! I love the sauce with the touch of bourbon. Nice twist. I’ll have to give this one a try. I’m with you, I now make my meatloaf on a baking sheet as well. That glaze looks delicious. 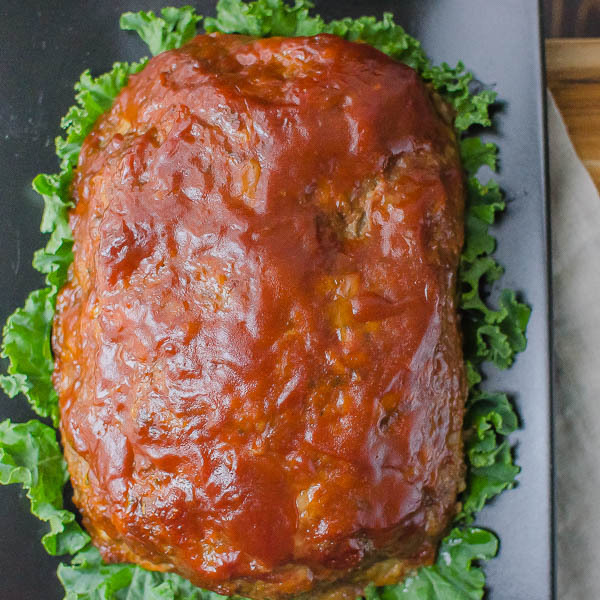 Your meatloaf sure looks like we could be good friends! 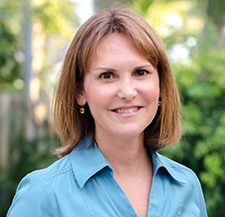 I love your photos and recipe. Perfect for dinner. Thanks. We all need friends — and friends that cook — that’s a bonus! We do it all in moderation, Sarah!